As a marketer, I am always looking for ways to cut through the clutter and reach my audience in a way that stands out. These days, the use of storytelling in marketing is all the rage. From TED presentations and keynotes to product advertisements and digital media, marketers now realize that it is more effective to tell a good story than it is to recite a long list of features and benefits. As, Nancy Duarte describes beautifully in her book "Resonate" and in her dazzling TED presentations, stories can be used to convey ideas that have the power to ignite massive change in the world. Stories are more memorable, have more impact and force us to distill what we are trying to communicate into something that is clear and easily repeatable. Most good stories have a protagonist that the audience can relate to. The protagonist is forced to face a series of obstacles that he or she must overcome before emerging triumphantly at the end. Storytelling can be used in presentations, web content, collateral, digital media or just about anywhere you are trying to convey an idea. However, the organizations that have maximized storytelling for the greatest impact are those that have gone beyond using it to communicate an individual idea and have leveraged it to build a successful brand. 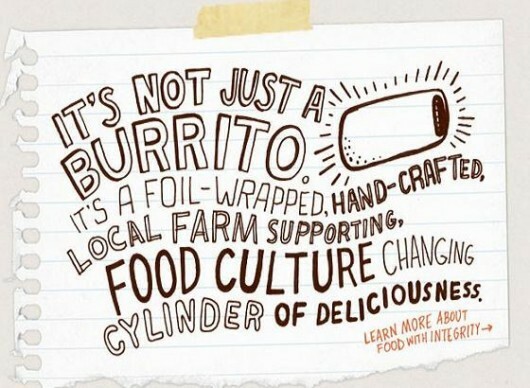 Much of Chipotle’s success can be attributed to their use of storytelling to create a world-class brand. So how did they do it? Well, by crafting an authentic story that matched the worldview of their target audience, and then by living that story in every aspect of their business. In Seth Godin’s book, “All Marketers Are Liars ” he explains that consumers notice (and embrace) stories that are consistent with their own views and opinions. Godin argues that people have predefined beliefs and prejudices that provide them with a way of viewing the world. This makes it extremely difficult to convince someone to change his mind about something and to pay attention to a story that is not consistent with a worldview. Rather, consumers gravitate towards stories that are framed in a way to reinforce their preexisting beliefs. For example, someone who is predisposed to worry about a failing economy and expansionary monetary policy is likely to be receptive of a story about buying gold as a hedge against inflation. Or for someone who believes in doomsday scenarios like earthquakes and terrorist attacks, a story about building a survival plan and buying non-perishable supplies will resonate. Chipotle succeeded by keenly understanding that there is a large and growing segment of the population that believes in healthy, unprocessed food and sustainable, responsible farming – and is willing to pay more for it. I’m not saying that they went down this path just to make up a marketing story. I think that they truly believe in what they’re doing. And as Godin explains, a story has to be truly authentic and believable to become successful because consumers have become so adept at uncovering lies and frauds. The company’s story resonated strongly with consumers who believed that their food should be naturally grown and free from manufactured ingredients. As Godin describes, consumers notice things that are consistent with their preexisting beliefs and then quickly make assumptions (often without a complete set of information) based on those beliefs. After making an assumption one is then very reluctant to change his or her mind, tending to take into account new information that supports rather than contradicts a belief. So, after hearing Chipotle’s story a consumer may easily jump to the conclusion that the food also tastes better because of a desire to believe that animals raised naturally produce better tasting meat. And people with strongly held beliefs tend to be more likely to retell the story to others. Branding: The success of Chipotles’ brand story is also attributable to strong execution. The company’s “Food with Integrity” message was thoroughly infused in every touch point of the customer experience. From recyclable product packaging and simple store design, to well crafted marketing materials, programs and advertising, the message was consistently reinforced. Restaurants: The restaurant design and dining experience has been carefully crafted to support the brand story. The kitchen is open and food is laid out and prepared in front of customers so that they can appreciate the freshness of the ingredients. The store design is clean and simple, incorporating elements of green design reflecting a commitment to minimize their impact on the environment. Website: The Chipotle website tells the story with creative animation that shows where their food is grown and includes pointers to recommended reading like “In Defense of Food” by Michael Pollan. Creatively produced videos are interspersed that tell Chipotle’s (and Steve’s) story and there’s a “Food with Integrity" section that helps to educate consumers about sustainably raised food and family farming. Cultivate Foundation: Chipotle runs the Cultivate Foundation using a separate website that retains the company’s visual design and brand elements. The foundation supports initiatives around family farming and education with the grants listed on the site, including $2 million from Chipotle. Marketing: Although much of Chipotle’s marketing has come through word-of-mouth marketing, the advertisements that they do run retain their irreverent, anti-establishment tone. In 2010, they ran an ad campaign that mocked the advice given to them by ad agencies. They have also sponsored free screenings of “Food, Inc.”, a documentary that describes the problems associated with agribusiness and factory farming. And during last year’s Grammy Awards they aired their “Back to the Start” TV ad featuring Willie Nelson covering Coldplay’s “The Scientist”. It was also played in theaters across the country. The video leads the viewer through a farmer’s journey, as his small farm becomes industrialized. Then, realizing the errors of his ways he returns to his roots of sustainable, family farming. It also seems to play as an apology from Chipotle to their base for losing their direction and selling out to McDonald's. We do, however, face challenges associated with pursuing food with integrity. For example, current economic conditions have led to naturally raised chicken and steak supply shortages. It can take longer to identify and secure relationships with suppliers that are able to meet our criteria, and there are higher costs and other risks associated with purchasing naturally raised or sustainably grown ingredients. Growth rate and weight gain can be lower for chickens, cattle and pigs that are not fed sub-therapeutic antibiotics and for cattle that are not given growth hormones. Organic and sustainable crops can take longer to grow and crop yields can be lower for organically or sustainably grown produce. Given the costs associated with natural and sustainable farming practices, and recently due to decreased demand as a result of the weak economic environment, many large suppliers have not found it economical to pursue business in this area. Will Chipotle’s brand story continue to drive strong growth? Certainly, not everyone will believe that a company once owned by McDonalds can be a torchbearer for healthy food and sustainable farming? Will they be able to continue to charge enough of a premium to cover higher food costs? Will the trend toward unprocessed, naturally grown foods continue? And will their story continue to be unique as new competitors source from sustainable farms? I have led marketing and product management initiatives for leading technology, media and software companies including Nuance Communications, Sun Micro, Apple Computer and DNN Corp. I received an M.B.A. from M.I.T.’s Sloan School of Management and a B.A. in Cognitive Science from Wesleyan University. I am currently the Director of Product and Solution Marketing at Five9, the leading provider of cloud contact center software . Thank you! Please check your email to complete the signup process. Thank you! Please check your email to complete the sign up process.